Resource allocation schemes for orthogonal frequency division multiple access- (OFDMA-) based cognitive radio (CR) networks that impose minimum and maximum rate constraints are considered. To demonstrate the practical application of such systems, we consider the transmission of scalable video sequences. An integer programming (IP) formulation of the problem is presented, which provides the optimal solution when solved using common discrete programming methods. Due to the computational complexity involved in such an approach and its unsuitability for dynamic cognitive radio environments, we propose to use the method of lift-and-project to obtain a stronger formulation for the resource allocation problem such that the integrality gap between the integer program and its linear relaxation is reduced. A simple branching operation is then performed that eliminates any noninteger values at the output of the linear program solvers. Simulation results demonstrate that this simple technique results in solutions very close to the optimum. With the widespread deployment of high data rate wireless networks and the improvements in video compression technologies, the popularity of and demand for wireless multimedia transmission have been constantly increasing. In an effort to guarantee the user satisfaction under different channel conditions, a number of crosslayer and multiuser resource allocation strategies have been proposed in the literature (see, e.g.,  and references therein). However, as the paradigm for spectrum access shifts towards that of cognitive radio , new algorithms are required to make the most efficient use of the available resources and provide the highest quality of service (QoS) to the subscribers. In such an environment, an important trait of the video processing subsystem is to be adaptive to the fluctuating bandwidth. Consequently, the recent scalable video coding (SVC) extension of the H.264 standard  is a suitable candidate. In SVC, a scalable bit stream can be viewed as a hierarchy of video layers, consisting of a mandatory base layer and a number of enhancement layers. As higher layer data is successfully received and decoded, the perceived quality of the video is improved. It follows that each SVC sequence would impose a minimum rate constraint, corresponding to the base layer rate, and a maximum rate constraint, corresponding to the transmission of all video layers, on the resource allocation sub-system. Resource allocation algorithms for scalable video transmission over noncognitive networks have been extensively researched over the last decade [1, 4–6]. Recently, the transmission over cognitive radio (CR) networks has become an area of interest (see, e.g., [7–9] and references therein). However, the algorithms found in the literature cannot be applied to a multiuser OFDM-based CR environment as they either do not consider the interference power limit imposed by primary users or do not consider the transmission of H.264 SVC in a multiuser network. As such, the approaches proposed in the literature will not offer optimum performance for the scenario considered in this paper. In this paper, we consider the transmission of fine grain scalable (FGS) [10, 11] video over CR networks and aim to perform subcarrier, bit, and power allocation for different cognitive users such that the sum rate of the cognitive users is increased, thus resulting in improved video quality. Although the scheme presented in this paper is general in nature, FGS video transmission is a practical implementation and is thus considered. We formulate the problem as an integer program (IP) that can be solved optimally using discrete program solvers. However, because of the computational complexity involved in this approach, we use the method of lift-and-project  to strengthen the problem formulation and thus reduce the integrality gap between the IP and its linear relaxation. Linear programming techniques can be used to solve this stronger problem formulation; however, the solutions may be nonintegral. In such cases, we propose a simple branching operation on only the fractional values at the output of the linear program such that a feasible solution is obtained. Simulation results confirm that this feasible solution is always close to the optimal value. To the best of the authors' knowledge, no previous work in CR has followed such an approach. Moreover, we present a novel near-optimal subcarrier and bit allocation methodology for multiuser transmission of block-based scalable video without making any impractical or oversimplifying assumptions. The main contributions of this paper can be summarized as follows. An integer programming formulation for the transmission of SVC video over OFDMA-based CR networks. A simple near-optimal allocation scheme based on linear programming techniques is presented, with results approaching the optimum. The paper is structured as follows. In Section 2, the initial problem for subcarrier and bit allocation for SVC transmission in a cognitive environment is presented. In Section 3, we present the techniques to strengthen the problem formulation. Section 4 presents a simple branching technique for obtaining a feasible solution. Simulation results are given and discussed in Section 5, and finally, Section 6 concludes the paper. where is the set of bits allowed on each subcarrier for example, if the supported modulation formats are BPSK, QPSK, 16-QAM, and 64-QAM; is the indicator variable that is equal to 1 only if a number of bits corresponding the th entry of are transmitted on the th carrier of user ; is the rate requirement for the base layer of user , is the rate required for all enhancement layer data to be transmitted, and ; is the interference power limit imposed on the th subcarrier, is the channel gain between the secondary base station and the th user on the th subcarrier, is the interference channel gain on the th subcarrier, and is the power required to transmit bits on a subcarrier if the channel gain is unity at a given target bit error rate. For -QAM modulation, the value of , at a desired bit error rate of , can be calculated using , where is the noise variance and . Alternately, common lookup tables for various modulation and coding schemes can be employed . For notational brevity, we let in later sections. The first constraint ensures that all users receive at least the base layer, while the second constraint states that no user is to transmit at a rate higher than the highest enhancement layer rate to avoid inefficient use of the scarce resources. The exclusive use of subcarriers is ensured by the third constraint while the fourth inequality enforces that the received power on any subcarrier at the primary receiver should not exceed the defined limit. Note that for coarse grain scalable (CGS) or medium grain scalable (MGS) video transmission, the first two constraints need to be replaced by a single one as explained in . The optimal solution of (1) can be obtained using common integer program solvers such as the branch-and-bound technique . However, the complexity involved in solving these problems increases exponentially with the number of variables and constraints, making the direct application of known algorithms inappropriate for dynamic systems such as CR networks. One way of reducing the complexity involved in solving integer programs is to make the convex hull of the problem as close to the ideal, integral convex hull as possible. Methods to achieve this goal are introduced in the next section. Strengthening of problem formulations and means of deriving the integral convex hull of optimization problems have been areas of active research over the past decades. In the case of binary integer optimization, a technique that has incited significant interest is the lift-and-project method [12, 18], where the basic principle is to raise the problem onto a higher dimensional space, where it is easier to derive facet defining inequalities  and then project the resulting polyhedron back onto the original space to obtain a much tighter formulation. In this paper, we consider the method proposed by Lovász and Schrijver in . In the lift-and-project method considered, every constraint in the problem definition is multiplied by each of the optimization variable, say , and its complement, . This multiplication process results in the lifting of the problem onto a higher dimensional space, where new variables and constraints are introduced. These new variables arise from the product of different optimization variables, such as , where . The new problem in the lifted space is then projected back to the original space by taking linear combination of the constraints such that all the new variables introduced are eliminated. By iteratively lifting and projecting the constraints, a convex hull with extreme feasible 0-1 points can be obtained. Figure 1 is a graphical illustration of the steps involved in the chosen lift-and-project method for a problem having two optimization variables. Assuming the initial optimization variables are and , the optimization variables in the lifted space are ,  , and . We next show an example of how this technique can be applied to the problem at hand (due to space restrictions, we only present the outcome of the lift and project method. The interested reader is referred to  for more details). 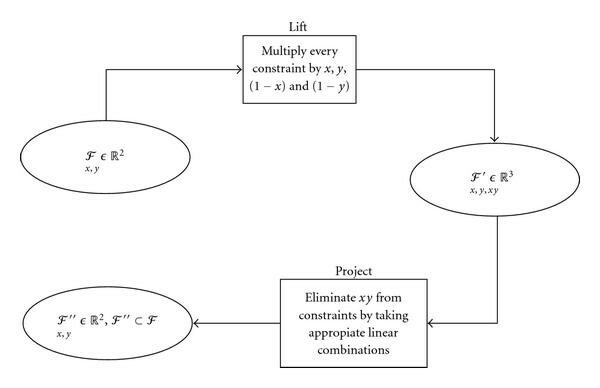 Illustration of lift-and-project method for a problem with 2 optimization variables. These cuts indicate that if the power needed to transmit using a given modulation scheme on a subcarrier is greater than the power limit of that subcarrier, then the indicator variable, , should be equal to zero. Although the ideal formulation (with an ideal formulation, that is, the extreme points of the convex hull are integral, a linear relaxation of the problem would produce the optimal integer solution) has not been achieved, this refinement yields a much tighter formulation than that given in (1). Simulation results showed that the linear relaxation of this enhanced formulation has a much lower integrality gap, compared to the linear relaxation without the extra constraints. For test scenarios with subcarriers,  , and ,  for each user and and users, respectively, and using the channel model described in Section 5.2 for over 2000 different simulation instances, it was observed that using the simplex algorithm  to solve the linear relaxation of (1) with the extra constraints from the lift-and-project led to an integral solution around 13% of simulation cases. This value contrasts with the case without the extra constraints where, in no instances, was an integral solution obtained. Moreover, these simulations showed that the percentage of nonbinary entries at the output of the simplex with the extra constraints was below 2% of the total number of variables, while this percentage was always above without the extra constraints and reached values of up to 17%. Such conditions would imply that solving the problem using the branch-and-bound method is highly impractical due to the large number of iterations that would be required. Although the lift-and-project method has provided a better formulation with far less fractional entries at the output of the simplex, it is desired that the output of the allocation algorithm be integral in all cases, while not requiring high computational complexity. On that account, we propose a simple branching operation on the nonintegral values obtained from the linearly relaxed problem. This methodology is presented in the next section. where the superscript stands for the transpose operation. In the above example, it can be seen that indicator variables pertaining to the second user are all binary, while those corresponding to the first one are not. However, it is observed that fractional entries that are greater than zero adds up to unity and both are at position indexed by . To solve the above problem, we propose a simple algorithm: namely to perform a simple branching operation on only the nonbinary values of following the initial execution of the simplex algorithm. In the example, the proposed technique would replace the fractional entries by the best combination of binary entries. The fractional entries of , , could be replaced by either or , and still produce the same optimal value. Note that values of would violate the third constraint of (1) and is thus not considered. The final allocation vector would thus be , which corresponds to the allocation if the problem is solved using the branch and bound technique. From a geometric perspective, the above branching operation can be viewed as slightly tilting the polytope so that one integer extreme point is favored over noninteger values. An illustration of the process is given in Figure 2. As stated in the previous section, it was observed after extensive simulations that the number of fractional values after running the simplex algorithm is within 2% of the total number of variables over which optimization is carried out. Thus, replacing the fractional entries at the output of the simplex algorithm with the possible binary values such that the constraints are not violated and choosing the one that yields the largest objective value as being the final solution is an efficient technique. This procedure is illustrated in Algorithm 1, where is the objective function, is the allocation vector output from the simplex program with (4) included in the constraint set. If is the number fractional entries from the simplex algorithm, this algorithm has a complexity of the order of . Given that in the worst case, only 2% of the total number of entries are fractional, for practical system sizes, such a technique results in good running time. It should be noted that although for large systems the fractional entries are not always as elegantly placed as is the case in the simple example considered, and the proposed algorithm can still be employed without suffering too severe performance drop compared to the optimal integral solution as shown in the results section. Algorithm 1: Branching operation to obtain binary feasible solution. Illustration of tilting operation to favour an integer extreme point instead of the whole optimal face. In this section, the performance of the proposed scheme is analyzed for the resource allocation procedure of FGS video. The maximum values obtained using the simple branching operation for different problem sizes were compared to the optimal solutions obtained through the branch-and-bound method over 1000 different simulation instances. A target bit error rate of was considered in all simulations with . Simulations were run using subcarriers with users and the rate requirements for a typical FGS video were scaled appropriately to match the available resources. It should be mentioned here that the purpose of this experiment is to show how close the final value of the proposed algorithm is to the optimal output of the binary integer program regardless of the simulation parameters. Because of the very high computational time required to obtain the output of the binary integer program for large problem sizes, for example, , only 100 instances with the were considered. Results indicate that the gap between the optimal value and the proposed method followed the same trend as for smaller problem sizes. Thus, the remaining simulations considered up to 64 subcarriers. The results are depicted as a cumulative distribution histogram plot in Figure 3. 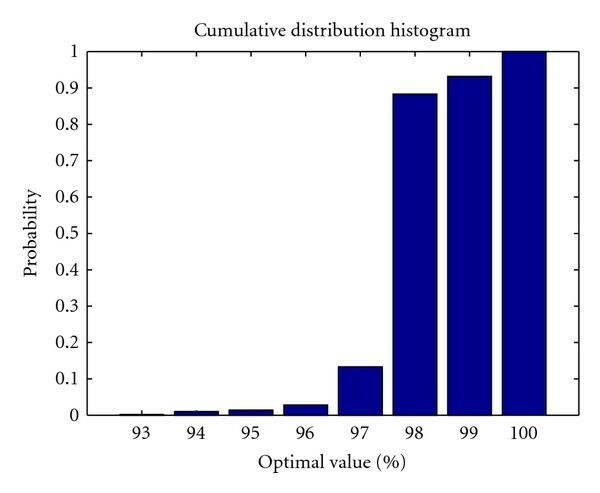 Cumulative distribution histogram to demonstrate gap between optimal and near-optimal scheme. It can be observed that by including the extra constraints derived from the partial projection and performing a simple branching over the linear relaxation of the extended problem, the results obtained are very close to the optimal value. In over 90% of the cases considered, the value reached is around 98% of the optimal, and values above 90% of the optimal value are always achieved. The benefit of this approach is a tremendous gain in processing time and complexity reduction relative to solving the original IP. However, since only the noninteger values are considered in the branching operation without changing other 0–1 variables, as is the case in binary integer programming solvers, the value attained is not always the optimal. The simulations in this section is to demonstrate the effectiveness and performance of our near-optimal resource allocation scheme. We compare the system presented herein to the suboptimal, linear-programming-based rate-adaptive (RA) resource allocation method of [22, 23], where the objective is to maximise the minimum rate in a downlink multiuser OFDM environment, given a total transmit power constraint. This objective is accomplished in a two-stage process. In the first stage, the authors of  assumed that a fixed modulation scheme is employed and each user is assigned a fixed number of subcarriers. Using linear programming techniques, each user is then assigned the required number of subcarriers such that the power required for transmission is minimised. In the second stage, an adaptive bit loading operation is performed such that the rate for each user is increased while not exceeding the total power budget and satisfying the target BER. 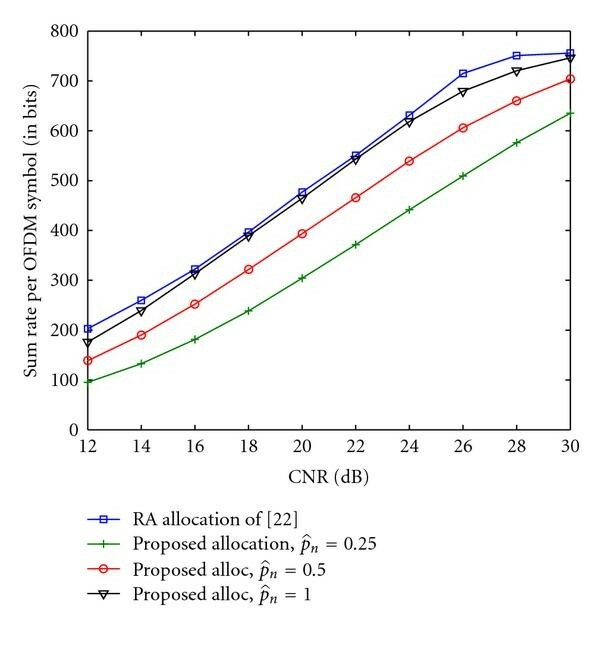 The rate achieved using the proposed near-optimal resource allocation scheme is compared to the rate attained using the RA method. A system with subcarriers, users, a target BER of 10−6 and a normalised downlink power budget of units is considered, where on average, the channel gain on each subcarrier is normalised to one. For both algorithms, an exponentially decaying, time-dispersive Rayleigh fading channel with taps and having a power delay profile defined by , where the decay factor is considered, which leads to a power difference between the first and last tap of approximately 30 dB. Without loss of generality, it is assumed that the channels for different users are independently and identically distributed (i.i.d) and that the supported modulation schemes are BPSK, QPSK, 16-QAM and 64-QAM. For the proposed scheme, we consider 3 cases where the received per-subcarrier interference power limit, , is set to the normalised value of 1 unit (i.e., 0 dB), 0.5 units and 0.25 units, respectively. Furthermore, it is assumed that the modulated symbols on each subcarrier have unit variance and the primary channel is modeled as an 8-tap exponentially decaying Rayleigh channel with a decay factor of 0.986. For all users, it was assumed that and are 60 and 350 bits respectively. The comparison of the average number of bits per OFDM symbol for both schemes is illustrated in Figure 4 for different channel-to-noise ratio (CNR) values. It can be observed that as the received interference power limit is increased, the performance of the proposed system approaches that of the RA scheme of . For , it can be seen that RA scheme would perform only slightly better. Nevertheless, the RA scheme does not consider the per-subcarrier interference power limit imposed by the primary system. In the cognitive radio environment, the secondary transmitter may need to transmit using lower power even though the channel experienced by the secondary user is good if the corresponding interference channel is strong. Consequently, the average sum rate achieved is lower. The probability of exceeding the interference power constraint is next investigated for the two resource allocation algorithms. 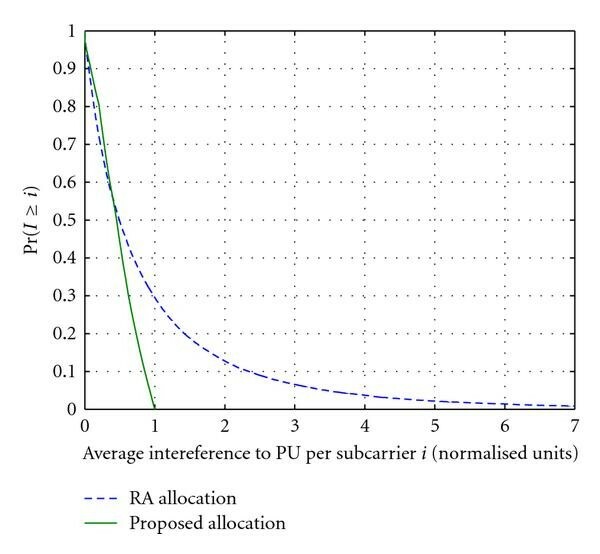 In Figure 5, we show the complementary cumulative distribution function (ccdf) of the interference power observed by the primary receiver using the RA scheme and the proposed method with set to 1 unit. Without the explicit constraint on the received power on each subcarrier, the probability that the RA allocation method violates the interference constraint is 0.3. Though this behaviour is expected since the algorithm does not consider the interference power constraint, the graph indicates that this algorithm could potentially be used in more flexible cognitive radio environments, where the primary system allows the interference power limit to be exceeded for a given proportion of time. This concept in investigated in the next subsection. Comparing average number of bits transmitted per OFDM symbol, with subcarriers, and users. Complementary cumulative distribution function of interference power to primary rx, with the IPC set to 1 on each subcarrier in the proposed scheme. In this section, we simulate and analyse the transmission of scalable video over cognitive radio networks using the different aforementioned allocation strategies. A downlink system with subcarriers and users is considered, where each user is transmitted a different video sequence encoded with H.264 SVC. The 3 video sequences considered are the "bus", "city", and "foreman" sequences , each encoded at a frame rate of 30 fps in the common intermediate format (CIF), that is, a frame size of 352 × 288 pixels, using the JSVM reference software . For all sequences, the quantization parameter (QP) for encoding the base layer was set to 34, while the QP of the highest enhancement layer was set to 24. The group of pictures (GOP) size for all the video sequences was fixed at 16 frames throughout the simulations. Given these video encoding parameters, the rate distortion plots of the three FGS sequences are shown in Figure 6. It can be seen that as the rate for each sequence is increased, a higher peak signal to noise ratio of the luminance component (Y-PSNR) is attained, till the point where all enhancement layers are transmitted. 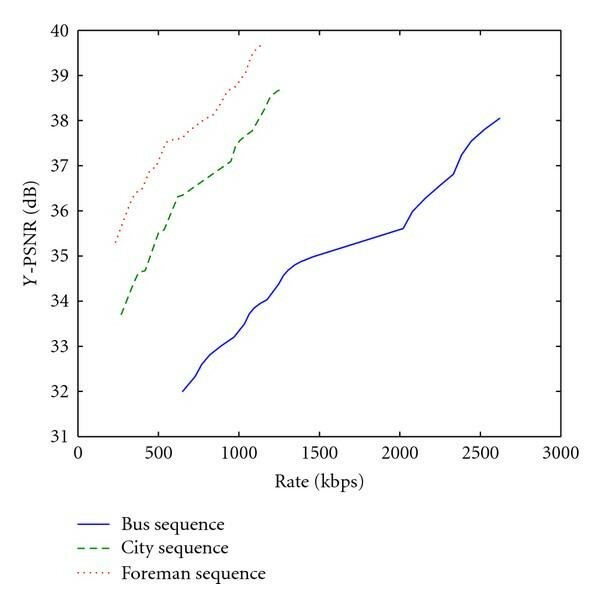 Based on the plot, it can be seen that the base layer Y-PSNR of the "bus", "city", and "foreman" sequences are 32 dB, 33.7 dB, and 35 dB, respectively, while the corresponding Y-PSNR when all enhancement layers are transmitted are 38.1 dB, 38.7 dB, and 39.7 dB. Similarly, the minimum rate requirements of the 3 sequences are 650 kilobits per second (kbps), 270 kbps and 230 kbps, respectively, while the highest rate requirements are 2600 kbps, 1270 kbps, and 1160 kbps. The difference in the minimum and maximum PSNR values of the 3 sequences are different. This is attributed to the different amount of motion and scene complexities between the sequences. Rate-distortion characteristics of different sequences considered in the simulations. For simulation purposes, it was assumed that a 5 ms time frame contains 48 OFDM symbols. Consequently, the minimum and maximum number of bits required per OFDM symbol for each sequence can be calculated by simple mathematical manipulations. The generic exponentially decaying channel model with a decay factor of 0.986 described in the previous subsection is used and the normalised per-subcarrier interference power limit of 1 unit, that is, 0 dB, and a total downlink power budget of units are considered. For illustration, we assume that the channels of both the primary and secondary users changes after each GOP period. Consequently, the resource allocation algorithm is performed after each GOP sequence. To ensure low probability of errors in the received video sequences, the target BER in the proposed scheme and the RA allocation method is set to 10−6. Based on the rate assigned to each user through the allocation techniques, the video stream corresponding to each user is truncated at the corresponding point prior to transmission. The latter process is carried out using the BitStreamExtractorStatic function in the JSVM software. The near-optimal allocation scheme is compared to the RA allocation and a channel-independent subcarrier allocation where QPSK modulation is used for all users over all subcarriers. The average Y-PSNR against CNR plot is shown in Figure 7. We should point out that the results considered are only for feasible instances. In practice, it may occur that the channel conditions and available resources do not allow all users to receive the minimum rate corresponding to the base layer rate. In that case, call admission control (CAC) is necessary where at least one user will be dropped and the resource allocation performed again for the remaining users . However, since CAC is out of scope of this paper, we do not consider dropping users should the available resources not satisfy the minimum requirements of all users (out of 1000 channel realisations, around 10% led to infeasible problems). It can be observed that the performance of the rate adaptive allocation is close to the performance with the proposed allocation scheme. However, as stated above, such a scheme always leads to higher than permitted transmit power on the subcarriers. Channel independent subcarrier allocation, as expected, resulted in the worst video performance. Although applying a fixed modulation guarantees that the minimum rate for video transmission is attained, there is no means of restricting the BER for channel unaware allocation. The reason for choosing the rate adaptive allocation technique of  for comparison is that the aim of that scheme is to ensure fairness among all users by minimizing the difference between the rates achieved. This approach is suitable for video transmission as it allows all users to attain the minimum QoS. In our proposed allocation method on the other hand, we ensure fairness by stating that all users should at least receive the base layer. The average quality of received sequences using the proposed scheme is next investigated for varying number of subcarriers. We consider the same simulation parameters as in the preceding simulations, where each of the secondary users is transmitted a different scalable video sequence, namely the "bus", "city", and "foreman" sequences. Figure 8 shows the average PSNR plot, averaged over all simulation instances and over the whole sequence duration, for the received sequence of the first user for , , and subcarriers, where increasing the number of subcarriers is synonymous to an increase in the available bandwidth. As expected, the increase in the number of available subcarriers lead to an improvement in the perceived video quality. Furthermore, as the number of subcarriers is increased, the PSNR gain as CNR increases is much larger. For small number of subcarriers, and using only practical modulation schemes, the percentage rate increase with increasing CNR for each user is less. Consequently PSNR improvement of the order of around only 1 dB is observed using 128 subcarriers, while a PSNR gain of about 3 dB is observed when the number of subcarriers is doubled. 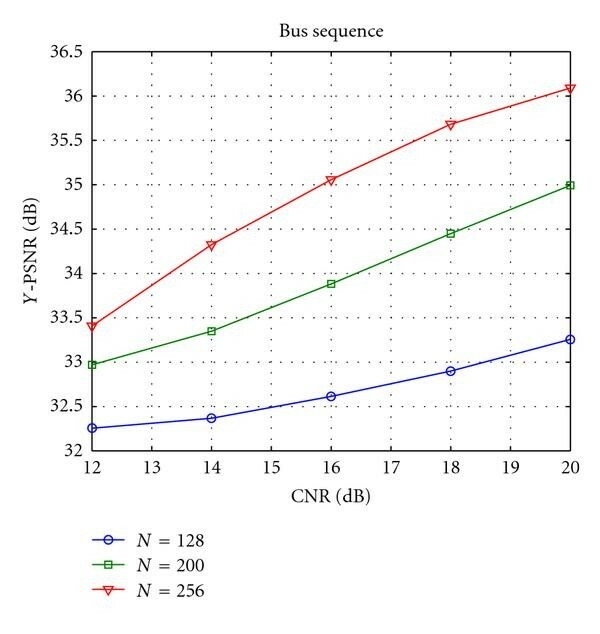 PSNR of BUS sequence using proposed near-optimal resource allocation scheme with varying number of subcarriers. Although the performance of the proposed allocation scheme and the rate-adaptive technique of  are similar, the RA method violates the per-subcarrier interference power constraint of the primary user around 30% of time as explained in the previous subsection. However, it is possible to reduce the probability of exceeding the interference limit to a given limit, say 10% of time. To this end, it was observed through simulations that the total transmit power budget for the RA scheme must be scaled down to 40% of the original value. Considering a model where each of the secondary users is transmitted the "city" sequence in CIF format, and using the same simulation parameters as above, the received PSNR using the RA scheme with power backoff is compared to the proposed method. The average PSNR plot averaged over all users is given in Figure 9. It can clearly be seen that scaling down the total power to limit the interference to the primary system is detrimental to the system, where the PSNR drop of up to 2 dB can be observed. Further reduction in the probability of exceeding the interference power limit using the RA scheme is possible, at the expense of a degradation in performance. 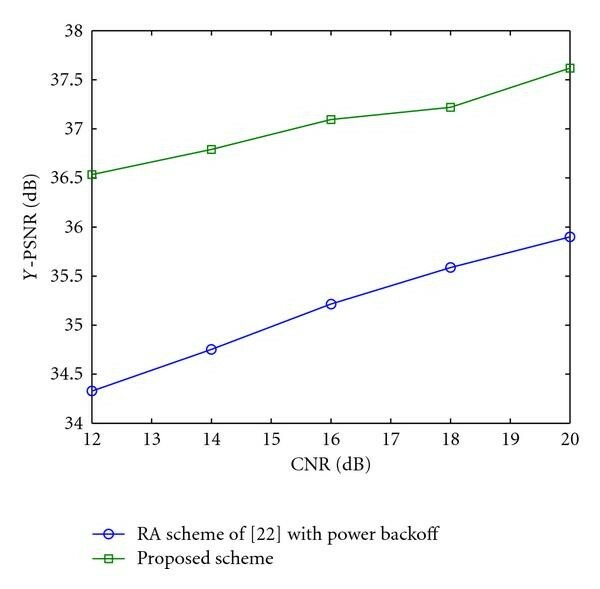 PSNR plot comparing RA schemes with power backoff and proposed allocation scheme for a system with 128 subcarriers, and 3 users, each user receiving the city sequence. In this paper, the resource allocation for scalable video transmission over OFDMA-based cognitive radio networks has been proposed and formulated as an integer program. To reduce the complexity in obtaining the optimal solution, the method of lift-and-project as presented in  is applied to strengthen the problem formulation. This stronger formulation can be solved using linear programming techniques, such as the simplex method, although the solution may occasionally be nonintegral. To obtain an integer feasible solution, we propose a simple branching operation on the fractional values at the output of the simplex method. Simulation results demonstrate that this simple two-step approach leads to a resource allocation that is very close to the optimal. Moreover, it was observed that resource allocation algorithms not considering the interference power constraint could be adapted to cognitive scenarios by scaling down the total transmit power at the expense of a severe performance loss. In contrast, the proposed resource allocation scheme never exceeds the interference power limit, while maximising the sum rate over all users and achieving fairness among multiple transmission. Fairness is ensured by the explicit constraint in the problem formulation that all users should be assigned a rate at least equal to the base layer rate. The authors would like to thank the directors at Toshiba TRL and the Centre for Communications Research, Bristol, for their continued support.